1 Doctora en Psicología. Directora del Centro de Investigación en Psicología Económica y Psicología Económica y Consumo. Profesora Titular del Departamento del Departamento de Psicología de la Universidad de La Frontera en Temuco (Chile). 6 Facultad de Ciencias Agropecuarias y Forestales, Universidad de La Frontera. 8 Estudiante Psicología, Universidad de La Frontera. The objectives of this study were to examine the psychometric properties of the Multidimensional Life Satisfaction Scale in university students (MSLSS) (Huebner, 1998) in a sample of university students from northern, central and southern Chile, where indicators of reliability and construct validity were examined. Also, it seeks to describe the levels of life satisfaction of students and to examine differences between gender and between socioeconomic statuses. The study is quantitative with a cross-sectional descriptive-relational design. The Multidimensional Life Satisfaction Scale was applied to a sample of 306 university students in northern, central and southern Chile, as well as a questionnaire that collected sociodemographic variables. It was used confirmatory factor analysis to evaluate the model expected from the five factors of the 40-item version of the scale. The results showed the scale had adequate psychometric behavior in this type of population, where also high satisfaction levels in overall and specific domains were found, and group differences were found by gender but not by socioeconomic status. Los objetivos de este estudio fueron evaluar las propiedades psicométricas de la Escala Multidimensional de Satisfacción con la Vida en Estudiantes (MSLSS) (Huebner, 1998) en una muestra de estudiantes universitarios de la zona norte, centro y sur de Chile, examinando indicadores de contabilidad y validez de constructo. Junto a esto, se buscó describir los niveles de satisfacción con la vida de los estudiantes y examinar diferencias por género y nivel socioeconómico. El estudio es cuantitativo con un diseño descriptivo relacional transversal. La Escala Multidimensional de Satisfacción con la Vida fue aplicada a una muestra intencionada de 306 estudiantes universitarios en el norte, centro y sur de Chile, al igual que un cuestionario que recogió variables sociodemográficas. Se utilizó el análisis factorial confirmatorio para evaluar el modelo esperado de cinco factores de la versión de 40 ítems de la escala. Los resultados demuestran que la escala tiene un comportamiento psicométrico adecuado para este tipo de población, también se encontraron altos niveles de satisfacción en los dominios generales y específicos, y diferencias en género, mas no en nivel socioeconómico. The concept of quality of life combines situations and conditions of the persons' living environment and the interpretations and evaluations that the individuals make on the objectives aspects of their surroundings (Meda et al., 2008). Subjective well-being is a part of quality of life, expressing people's satisfaction and their degree of pleasure with specific or global aspects of their existence, in which positive moods prevail. Therefore, it is considered part of health in its most general sense, being relevant to every sphere of human activity (García-Viniegras & González, 2000). Martínez (2004) mentioned that research into subjective well-being is one of the three ways to assess people's quality of life, together with economic and social indicators, thus suggesting that how people feel and what they think about their life is essential to understanding their well-being. From this perspective, the concept of subjective well-being has two dimensions: cognitive and affective. The cognitive component of subjective well-being is life satisfaction, either globally or by specific domains, whereas the affective component refers to the presence of positive feelings, which some authors call happiness (Arita, 2005). Life satisfaction can be defined as the positive evaluation that a person makes of his life in general terms, or of particular aspects (family, studies, work, health, friends, free time) (Diener, 1994; Diener, Suh, Lucas, & Smith, 1999; García-Viniegras & González, 2000; Liberalesso, 2002). This satisfaction arises through a transaction between the individual and his micro-and macrosocial environment, in addition to the current and historical elements of this environment (including material objective and social conditions) that offer certain people opportunities for personal development. It is an experience linked to the present with projection into the future, as well as the balance between these two periods (García-Viniegras & González, 2000). Gilman, Easterbrooks and Frey (2004) reported that the relevance of studying of life satisfaction is based on this concept transcending the immediate effects of life events (Heady & Wearing, 1992) and moods (Seidlitz, Wyer, & Diener, 1997); it is less ephemeral than the affective state (Diener & Diener, 1995) and more stable over time (Diener, 2000; Eid, & Diener, 2004). Ultimately, life satisfaction is not simply a result of other individuals' psychological states, but it is also influenced by important psychosocial relationships (Galindez & Casas, 2011). In Central and Latin America, including Chile, life satisfaction has tended to be assessed using the Life Satisfaction Scale by Diener, Emmons, Larsen and Griffin (1985) and adaptations of it. This scale is guided by the overall assessment of the concept, as reports of studies on the evaluation by domains are found to be insufficient in these cultures. In light of previous findings, approaching the construct of life satisfaction including its various domains contributes to a fuller understanding of the variables that affect it, which requires instruments that include a multidimensional measurement. At the same time, its measurement in university students is relevant given that they are at a complex stage of life, associated with the resolution of tasks not comparable with other times in life (Gomberoff, 2003). According to previous studies with university students, the level of life satisfaction could affect a variety of life domains, such as eating behavior patterns (Schnettler, Miranda, Sepúlveda, & Denegri, 2011), physical and social well-being (Zubieta & Delfino, 2010), self-concept (Zegers, Rojas-Barahona, & Forster, 2009), future time perspective (Martínez, 2004), among other variables. Negotiating their way through university is a complicated experience for many young people, where various competencies and abilities are put into play to achieve the goals of the chosen professional training, facing a myriad of stressors. These include responding to greater academic demands, changes in social support networks, demands for greater autonomy and prominence, vocational or academic failure, living alone for the first time if they come from another city, among others (Micin & Bagladi, 2011). Accordingly, their levels of life satisfaction must be identified early, since this stage is a precise space to change negative behaviors (Florenzano, 2005; Gomberoff, 2003; Martínez, 2007; Micin & Bagladi, 2011). According to previous studies with university students, the level of life satisfaction could affect a variety of life domains, such as eating behavior patterns (Schnett-ler, Miranda, Sepúlveda, & Denegri, 2011), physical and social well-being (Zubieta & Delfino, 2010), self-concept (Zegers, Rojas-Barahona, & Forster, 2009), future time perspective (Martínez, 2004), among other variables. Differences according to gender and socioeconomic level have also been observed. In this latter case, both women (Zubieta & Delfino, 2010; Zubieta, Muratori, & Fernández, 2012) and those at the highest socioeconomic levels (Martínez, 2004; Zubieta & Delfino, 2010) have a greater overall life satisfaction than their comparison groups. Huebner (1994) contributes to the study of this construct with the Multidimensional Students Life Satisfaction Scale (MSLSS) by revealing the need to know the different levels of satisfaction related to specific dimensions in greater depth. This instrument is designed to provide a multidimensional profile of the youth population, originally schoolchildren, with respect to five domains (family, studies, friends, neighborhood and self), and it also assesses overall life satisfaction. The domain Family refers to satisfaction with the student's relationships with family members and the relationships the family members have with each other; the domain School refers to satisfaction with different aspects of the school environment, such as interest in school, learning and school activities; the domain Friends seeks to measure satisfaction with the relationships that students maintain with their peers; the domain Neighborhood evaluates satisfaction with the surrounding spaces and with the people in the neighborhood; and finally, Self refers to the satisfaction felt with oneself and the opinion of others. The MSLSS was reviewed (Huebner, Laughlin, Ash, & Gilman, 1998) and generally showed acceptable internal consistency coefficients for all the domains and globally. Additionally, in subsequent studies conducted to evaluate its psychometric properties in its English version and in the original target population, stability was established in terms of reliability and support for the multidimensionality (Greenspoon & Saklofske, 1 997; Greenspoon & Saklofske, 1998; Gilman, Huebner, & Laughlin, 2000). In Chile, only recently has the MSLSS come into use, applying the instrument to children and adolescents (Chavarría & Barra, 2014; Oyanedel, Alfaro, & Mella, 2015; San Martin & Barra, 2013). Although Schnettler et al. (2014) evaluated the scale preliminarily in university students and there was little evidence of its psychometric behavior in the country, this study was designed to describe multidimensional life satisfaction in a broader sample of university students from northern, central and southern Chile. Specifically a) to examine the psychometric properties of Huebner's Multidimensional Life Satisfaction Scale (1998) in its application to university students, b) to describe the levels of life satisfaction in students, c) to determine whether there are differences among students about life satisfaction according to gender, and d) to determine if there are differences among students about life satisfaction according to socioeconomic level. In this sense, in relation to the first objective, it was expected that psychometric properties would be found adequate, that is why the following hypotheses are proposed: H1: Internal consistency greater than 0.70 will be observed between elements of global scale and domains. H2: The proposed five factors structure which compose the scale will have well-adjusted with the data. , Regarding the second objective, previous studies have reported that university students assess their lives positively (Barraza & Ortiz, 2012; Domínguez-Espinoza, Salas, Contreras, & Procidano, 2011; Gómez, Villegas, Barrera, & Cruz, 2007; Martínez, 2004; Schnettler et al., 2011; Moyano, Cornejo, Carreño, & Muñoz, 2013; Schnettler et al., 2013; Zubieta & Delfino, 2010; Zubieta et al, 2012), which provides the descriptives hypothesis: (H3) A level above the central point of the scale of life satisfaction by domains will be observed in university students. In relation to the third and fourth objectives, the current state-of-the-art reveals differences according to gender and socioeconomic level where women (Zubieta & Delfino, 2010; Zubieta et al., 2012) and the highest socioeconomic levels (Martínez, 2004; Zubieta & Delfino, 2010) present more positive assessments than their comparison groups, and it is therefore expected that: (H4) In female university students, the level of life satisfaction by domains will be greater than in male university students. (H5): The higher the socioeconomic level of the university students, the greater will be the level of life satisfaction globally and by domains. The population was comprised of students enrolled at some of the 25 traditional universities belonging to the Rectors' Council of Chile (CRUCH). From this group, universities were selected so that these were considered representative and so that these were located territorially from the north to the south of Chile. Within each university, the sample was determined through convenience sampling. From this, the sample was made up of 306 volunteer students in the second and fourth year of universities located in the regions of Arica and Parinacota, Metropolitan, Maule, the Araucanía and Magallanes, from various undergraduate degrees. Thus, the sample was comprised of students with an average age of 22 (SD = 2.519), of which 40% were men and 60% were women, with a distribution by socioeconomic level (SEL) of 15% high, 26% middle high, 31% middle, 20% of middle low and 8% low. According to the nature of the data, time dimension and proposed objectives, the study is quantitative with a cross-sectional descriptive-relational design (Hernández, Fernández, & Baptista, 2006). The Multidimensional Students Life Satisfaction Scale (MSLSS) developed by Huebner (1994, 1998) measures the levels of life satisfaction in students. This scale has shown stable levels of reliability that range between 0.70 and 0.90 in test-retest applications (Huebner, 2001). On the other hand, the scale shows Cronbach's alpha coefficients between 0.90 and 0.92 for the global scale and 0.72 and 0.85 for the specific domains (Huebner & Gilman, 2002; Sawatzky, Ratner, Johnson, Kopec, & Zumbo, 2009). 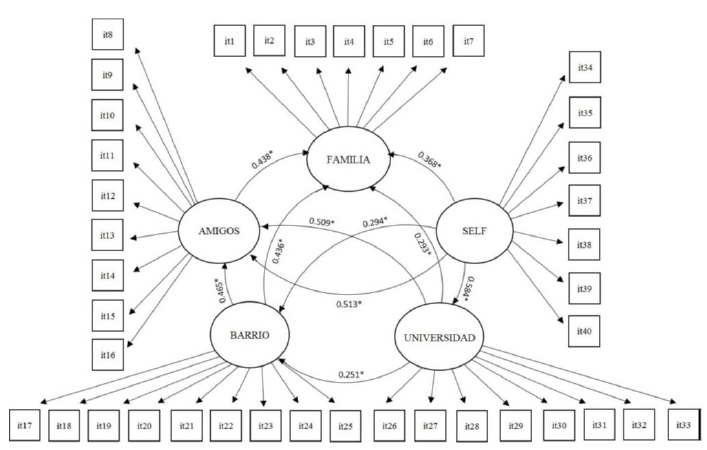 For this study, the scale was translated into Spanish and adapted to university students by the research team. To evaluate the linguistic adjustment an expert in the area worked with two bilingual researchers. Later it was subjected to a test run with 40 students, which allowed some smaller writing aspects to be corrected. The final instrument contains 40 items in a reverse-coded format on a 6-point Likert scale ranging from "strongly disagree" (1 point) to "strongly agree" (6 points). It evaluates satisfaction in five domains of life, family, studies, friends, neighborhood and self. According to Huebner's orientations (2001) and because the domains have an unequal number of items, the domain and the total score are obtained by adding the responses and dividing by the number of items in each domain or the total number to obtain the overall assessment. Sociodemographic questionnaire: this contains 7 questions that investigates a series of sociodemographic variables, of which gender and socioeconomic level are used here (the latter calculated according the ESOMAR scale; Adimark, 2000). The ethics committee of the La Frontera's University, reviewed and approved the research protocol. The translated version of the instrument was proven with a sample of 40 students from University of La Frontera, with similar characteristic of the total sample, it wasn't found problems for their comprehension. It was made a formal contact with the authorities of the corresponding universities through they were invited to participate in the research. The inclusion criterion for the present study was being a student enrolled in first year (started in 2013) or third year (started in 2011) at their respective universities. After approaching the universities, the selected students were invited to participate by having the objectives of the study explained to them and being assured of anonymity and confidentiality. Those who accepted to participate voluntarily and without remuneration were asked to accept a digital informed consent. Subsequently, the questionnaire was applied in person, using an electronic method of response recording (Question Pro). According to the study objectives, the first step was to evaluate the psychometric properties of the MSLSS (Huebner et al., 1998), since it is a scale used only recently in Chile and Latin America. For this, evidence of the reliability was obtained by analyzing the internal consistency reliability through calculation of Cronbach's alpha (Cronbach, 1951). Also, to determine validity according to evidence based on the internal structure, a confirmatory factor analysis (CFA) of the structure of the dimensions was performed (Abad, Garrido, Olea, & Ponsoda, 2006). It was considered that the sample size was large enough for this kind of analysis, as the dataset had at least 5 participants per item, according to recommendations by Nunnally (1967) and Martínez-Arias (1995). For this analysis three aspects were considered according to Abad, Olea, Ponsoda, and García (2011): First, the weighted least squares mean and variance adjusted (WLSMV) method was chosen as estimator, which is robust and suitable for categorical data (Brown, 2006; Muthén & Muthén, 2007; Muthén & Muthén, 2010). Second, the fit of the model was contrasted (Schreiber, Stage, King, Nora, A. & Barlow, 2006) using three types of measurements of fit: absolute measures of fit including the Chi-squared index (X2) and the root mean square error of approximation (RMSEA), comparative measures of fit including the non-normed fit index, also called the Tucker Lewis Index (TLI) and the comparative fit index (CFI), and finally the parsimonious fit measures with the Chi-squared ratio by degrees of freedom (X2/ df). The parameters for the indices of fit always have a certain degree of arbitrariness (Lance, Butts, & Michels, 2006; Marsh, Hau, & Wen, 2004), which is why different goodness-of-fit indices must be considered. The cutoff points that were used in this study were the following: RMSEA < 0.1, TLI and CFI > 0.9 and X2/df < 3. A graphic representation of the CFA model was created as this would facilitate its understanding. For this analysis, the statistical program MPLUS v. 7 was used (Muthén & Muthén, 1998- 201 2), suitable for procedures based on structural equation modeling. Next and in line with the second objective, to determine the university students' levels of satisfaction, a student's t-test was performed for a sample comparing the scores with the central point (3.5) of the domains and the global scale; therefore, means higher than the cutoff points are the positive values of this construct. This analysis was complemented by measuring the effect size using the standardized mean difference or Cohen's d (Cohen, 1988). To fulfill the third objective oriented toward ascertaining the mean differences of the students' multidimensional life satisfaction according to gender, a student's t test for independent samples was used for the first comparison, complemented by measuring the effect size using the standardized mean difference or Cohen's d (Cohen, 1988). Finally and to fulfill the fourth oriented toward ascertaining the mean differences of students' multidimensional life satisfaction according to socioeconomic level, a linear ANOVA was performed, complemented by measuring the effect size using eta-squared (η2). These analyses were conducted using the software IBM SPSS statistics v. 20. For this section, the results of the psychometric properties of the scale corresponding to the first objective will appear first; then the findings will be discussed according to the rest, and to contrast the hypotheses. In terms of the reliability of the scale and its domains, the total test reveals a Cronbach's alpha coefficient of 0.90, and by domain it showed the following values: 0.89 for Family, 0.86 for Friends, 0.84 for Neighborhood, 0.79 for University, and finally 0.86 for Self. With these results, H1 was confirmed, indicating that there would be internal consistency greater than 0.70 between elements of the global scale and by domains, being consistent with the previous studies, and reaching an adequate parameter of reliability. In terms of the validity of the scale according to the evidence-based on the internal structure and considering that all the exploratory factor analyses (EFA) run in previous studies had shown a stable structure of 5 domains, a CFA was conducted on the measurement model. This revealed adequate goodness-of-fit indices with the following results: X2(730) = 1 961.421, X2/df ratio = 2.69, RMSEA = 0.074, CFI = 0.918, TLI = 0.913. According to the considerated cut-off points, four of the indicators are in acceptable ranges to indicate a proper adjustment, being X2 the one which doesn't have an expected behave, however this indicator is susceptible to the number of participants, since if the sample is big enough, any model will be unsuitable, because increasing the sample size increases the power to detect statistically significant discrepancies which are irrelevant from a practical point of view (Abad et al., 2011). From the data obtained from this analysis on the corresponding matrix, the model of five correlated factors was accepted (see Figure 1), with 40 items in total (see Table 1 ), confirming H2, which indicated than the proposed structured will be well-adjusted with the data, being consistent with previous studies where was evaluate the instrument's internal validity. Figure 1 Model obtained from the CFA and correlations between factors. Table 1 Non-standardized factorial loads of the items by factor. Note: ־p <.001University students' levels of life satisfaction. Additionally, with regards to obtaining evidence of the relation with others variable, the CFA of the previous model and the satisfaction factor with the global life according to the data of the scale of Dierner et al. (1 985) revealed adequate goodness indices, with the following results: X2 (930) = 2204,779, p = 0.001, X2 / gl = 2.37 ratio, RMSEA = 0.067, CFI = 0.921, TLI = 0.916, likewise, four of the indicators are acceptable to indicate a good adjustment ranges, with X2 escaping as expected, previously justified. It can be mentioned that in the six factors, mean and significant correlations are observed as shown in Table 2. The scale of Diener et al. (1985) correlates with all domains of the Huebner et al. (1998) giving evidence of the convergent validity of the latter, and therefore confirming the hypothesis 3 that indicated that there is an association between the values of the scales that measure the same construct. 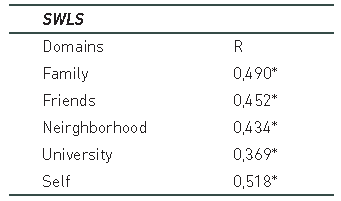 Table 2 Standardized correlations between domains of MSLSS y SWLS. Table 3 Comparison of means with the central point of the scale (globally and by domains). For the third objective, oriented toward detecting differences according to the demographic variable gender, the student's t-test indicated significant differences in the domains Overall Satisfaction, Friends and University. In Overall Satisfaction (t(303)= -2.593, p = 0.001, d = 0.30) women (W = 4.69, SD = 0.54) reported higher levels of satisfaction than men (W = 4.51, SD = 0.59) (with a small effect size). Likewise, in the domain Friends (t(303)= -3.078, p = 0.002, d = 0.36) women (W = 5.23, SD = 0.69) presented higher means men (W = 4.96, SD = 0.78) (with a small effect size), and in University (t(303)= -3.501, p = 0.001, d = 0.41), again women (W = 4.64, SD = 0.73) had higher levels of satisfaction than men (W = 4.33, DS = 0.78) (with a small effect size). This result means that hypothesis 4 is accepted. For the fourth objective and the variable socioeconomic level, The Kolmogorov-Smirnov test was performed, giving a test statistic of 0.163, which being greater than 0.05 shows a normal distribution. The linear ANOVA test results showed significant differences only in the domain Neighborhood (F(1) = 10.617, p = 0.001, η2 = 0.033) (with a moderate effect size, 33%), presenting a fit to the straight line according to SEL. That doesn't allow to accept the hypothesis 5. In recent years, research into quality of life has widened its areas of focus, including the measurement of subjective well-being as an important part of the assessment that people make of their current situation. In this context, evaluation of the psychometric properties and specifically the analysis of reliability and a CFA of the MSLSS, an instrument with ample theoretical support and good behavior through the years of use in other contexts and countries, is a relevant methodological contribution. In this study, the instrument showed adequate psychometric behavior, which contributes with a new valid and reliable tool at the level of construct validity for the multidimensional measurement of life satisfaction in young Chilean people at university. University students reported a high level of life satisfaction in general and by domains, which is consistent with results from other studies conducted on this population with other scales (Barraza & Ortiz, 2012; Domínguez-Espinoza et al., 2011; Gómez et al., 2007; Martínez, 2004; Moyano et al., 2013; Schnettler, et al., 2011; Schnettler et al., 2013; Zubieta & Delfino, 2010; Zubieta et al., 2012). This implies that despite the difficulties inherent in youth development, the stress associated with academic life and the changes which students face seemed not to affect the assessments the students made of their life satisfaction (Páez, Bilbao, & Javaloy, 2008). In terms of the domains that seem to influence the assessment of students' life satisfaction, it was observed that although all of these had positive values, the highest was in the domain Friends. This could be related to a characteristic of youth centered on the need to maintain positive relations with other people, preserving stable social bonds and having friends one can trust (Díaz et al., 2006). By contrast, the lowest mean was in Neighborhood, which may be associated in part with the concrete comparison between the neighborhood of origin and the one of current residence, since a high number of students must leave their family surroundings and migrate to cities far from their homes to attend university. Also, it is in part to the very fact of having to leave their familiar surroundings where they raised and have bonds and go somewhere that seems more distant to them (Micin & Bagladi, 2011; Denegri et al., 2014). In terms of the relation with sociodemographic variables, the analyses showed that women presented higher overall satisfaction and in the domains Friends and University than the men. This may be associated with certain characteristics of gender identity and the differential socialization between the sexes. In this process, women are socialized early on to be more social, friendly and oriented toward others (Aguilar, Valdez, González-Arratia, & González, 2013). In terms of the relation with sociodemographic variables, the analyses showed that women presented higher overall satisfaction and in the domains Friends and University than the men. This may be associated with certain characteristics of gender identity and the differential socialization between the sexes. In this process, women are socialized early on to be more social, friendly and oriented toward others (Aguilar, Valdez, González-Arratia, & González, 2013). This also implies a high value placed on the relationship with the social surroundings as a facilitator of goals and stability and confidence on a relational level (Zubieta & Delfino, 2010; Zubieta et al., 2012). On the other hand, increased access to education and the female presence in the labor market are achievements of recent decades (Vega-Robles, 2007), and this could generate a more positive assessment by women as they become part of this change. By contrast, the results do not support the notion that life satisfaction increases when SEL rises. This information may be explained in part by studies suggesting that the relationship between income and subjective well-being appears instead to be curvilinear, and that once basic needs have been satisfied, there is no necessary relationship between the wealth of nations and the sense of well-being, nor between this and the degree of individual wealth (Lane, 2000; Moyano et al., 2013; Veenhoven, 1991). It may be hypothesized that when basic needs are satisfied, individuals move towards a post-materialistic stage in which the core aspiration is self-realization (Inglehart, 1990). To sum up, on the one hand the findings here confirm the results of previous studies and therefore contribute to the consolidation of the framework of variables that affect life satisfaction during youth (Barraza & Ortiz, 2012; Denegri et al., 2014; Moyano et al., 2013; Schnettler et al., 2013; Zubieta & Delfino, 2010; Zubieta et al., 2012). On the other hand they provide more specific background information in relation to the student population which can serve as a reference for decision-making in public policies and intervention in mental health. This is established by considering that students with a greater subjective well-being will be better able to orient their life plans, make them concrete, and thus achieve a greater personal potential, contributing to their societies' creative capacity, where progress and well-being depend on the health and development of those who comprise it (Díaz, Carús, Macossay, & Barbosa, 2010). As a limitation, the study characteristics and the nature of the sample prevent generalization from university students to the youth population at large although, the results allows to accept the descriptive hypotheses; therefore, these results are only applicable to individuals with characteristics similar to those of the respondents, i.e. university students from the mentioned universities, it is necessary to consider future studies with representative samples that will allow the generalization of the results to the entire population of university students. A future line of enquiry may be to delve more deeply into the relations and meanings that underlie the level of satisfaction in the domain Neighborhood and its relation to the migration of students for study purposes. Based on the obtained results and considering future researches with representative samples, it is expected to contribute with data to the residence policies for university students. Forma de citar: Denegri Coria, M., González, N., Elgueta, H., García, C., Sepúlveda, J., Schnettler, S., Vivallo, O., & Salazar Valenzuela, P. (2017). Life Satisfaction in Chilean University Students: An Examination of the Relation between Gender and Socioeconomic Level. Rev.CES Pscco, 11(1), 40-55.